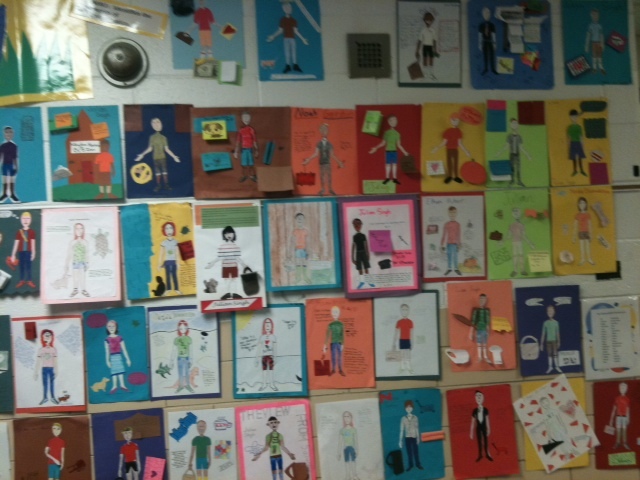 As we start to finish up The View from Saturday I had my students create a character sketch. They were given a rubric ahead of time, and when they turned it in, I had them grade themselves before I grade them. They were given the profile of the body to work with. They were to mount it on a sheet of colored paper. They had to have the character’s name on either the top or the bottom of their project. The character had to have 2 excerpts from the text that describes the character of the character. They then had to have at least 2 accessories that symbolize or belong with the character. They had to be creative, colorful, and I have to be able to understand it. I had lots of students do an amazing job with it, and then I had some students who just slapped it together. They had three days in class to work on it and two nights at home. So there were no excuses and I was not lenient on grading them. To finish up this unit, we are having a Novel Tea on Friday. I’ve purchased tablecloths to cover the desks that I will be placing together where they will sit. I also have 2 long tables that will go in my room with a tablecloth over it. One long table with have the hot tea brewers, and the other will have the trays of food. The tables will have fresh flowers in vases. Hot tea in teapots. And each student will have a plate of food inspired from The View from Saturday. This includes Ruggalach, Cucumber Sandwiches, Oreos, etc. It’s going to be a great time. I have parents volunteering each class period to help out by serving food for the kids. I think the kids are going to really enjoy it. I can’t believe I’m almost a month into my first year teaching. It’s been stressful and exhausting. I’ve still really enjoyed it. I’m starting a Reading Bowl club at school and that’s going to be even more to take on. I’ll be sure to try and blog more of what is happening. We’ve been doing different things in class in connection with the novel The View from Saturday. Today we did Calligraphy in Language Arts. I had my students create their own name plates using calligraphy pens, with india ink in bottles. They learned to dab their pens in ink and write. 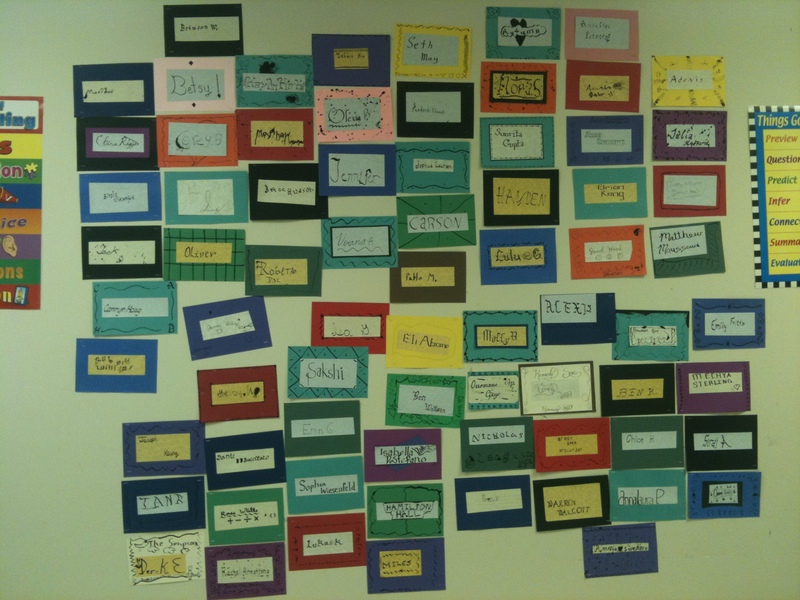 My first period got to excited that once their name plate dried they went to staple them onto the wall. As you can tell there’s some crazy positions on the wall, that would be the first class that was placed up there. I then took over stapling privileges and tried to fix it. 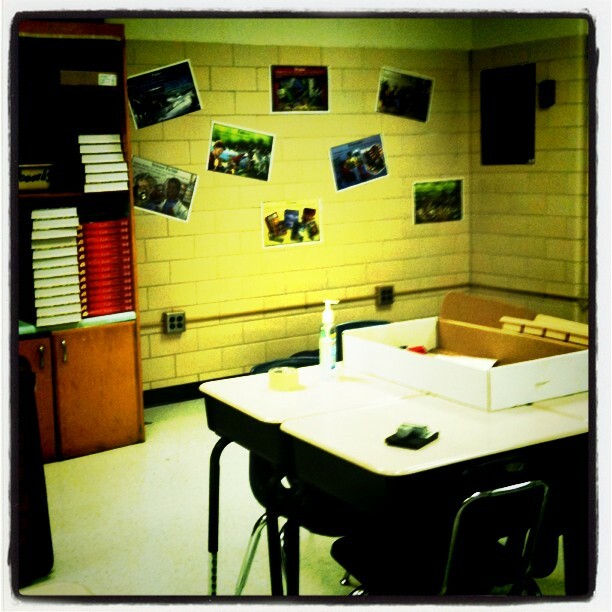 It still isn’t as organized as I’d like, but I suppose it does give my classroom wall some character. It’s a nice visual representation of the kids I have. 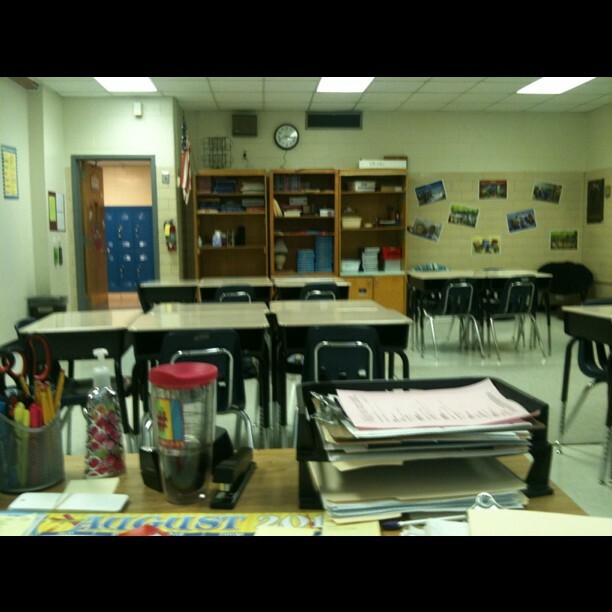 My classroom from my desk. That back right corner is my reading corner. Those shelves are a work in progress. The teacher before me left a lot of stuff that I’m still going through. They are also storage for the kids’ instruments. Every student at my school is in band or orchestra. That blue basket on the left is for lunches. Those popcorn tubs have supplies for groups. There’s colored pencils, markers, etc. 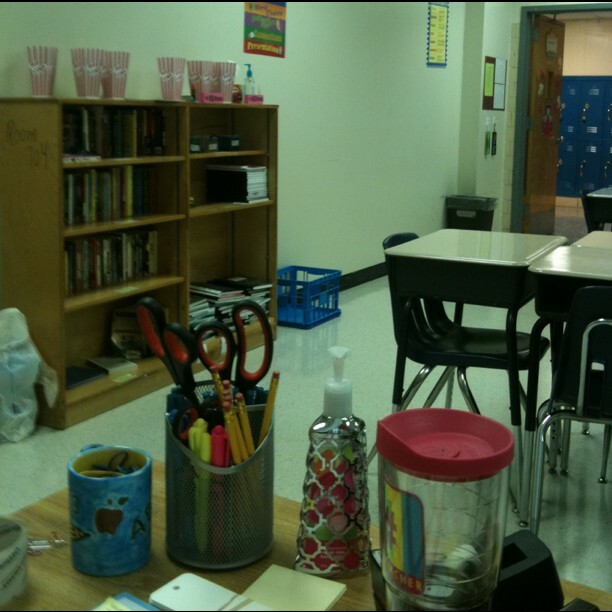 I also have one of my classroom boxes of Kleenex, hand sanitizer, erasers. It’s also where I have my classroom library books, that I’m slowly going to grow. I am quite proud that it’s only been 7 days of school and I have 15 books checked out to students. 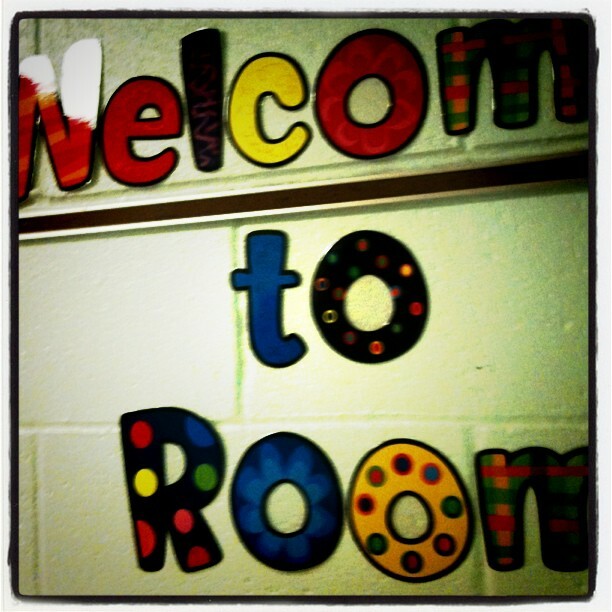 The front of my room. My board has homework and what we’re doing for the day on the left. The right hand side has our standards. Of course you can also see one of my student computers. 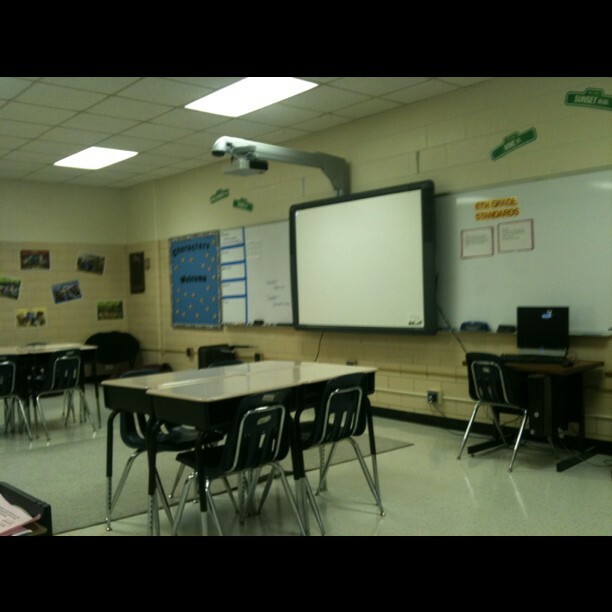 That one is also connected to my promethium board. It’s my first time using a promethium board, and I’m already in love. Granted so far I’ve only used it for our Daily Practice Grammar, but it’s great fun writing on it. Just a quick little post to show you what my room kind of looks like. There’s actually other stuff on the side of the room my desk is on. I’ll have to take pictures of that soon. I wish I had blogged more these past couple days, but the only word to truly describe them is: EXHAUSTING! I am just exhausted. My first day was just a whirlwind. At my school, we assign lockers, scan textbooks, hand them out, and get them all situated during homeroom. It was a little bit of chaos. These kids were so confused on how to open their lockers, what to put in them, etc. Once we got past that mess, things were just fun. I absolutely love my homeroom. They’re precious. Their parents have been so incredibly supportive it’s scary. I mean I knew they would be great, I had heard that at this magnet school the parents truly put in effort to make their kids succeed there, and it is so true. I tell kids to bring magazines to cut up by Friday, and most of my kids brought them Tuesday. I couldn’t believe it. I did my student teaching in an 8th grade public school and it was like pulling teeth trying to get kids to bring stuff to class. So this is different. I also handed out our first novel yesterday, The View from Saturday. It’s a cute book about 4 Sixth Graders at an Academic Bowl State Championship. I assigned the kids 20 pages due today. I had some kids ask me if it was okay if they kept reading. Um, of course it’s okay! It’s taking some adjustments for me, but things are working out. I’m enjoying the people I work with. I’m getting the hang of how much time I have to teach and a feel for the kids. My next 2 days are a piece of cake too. 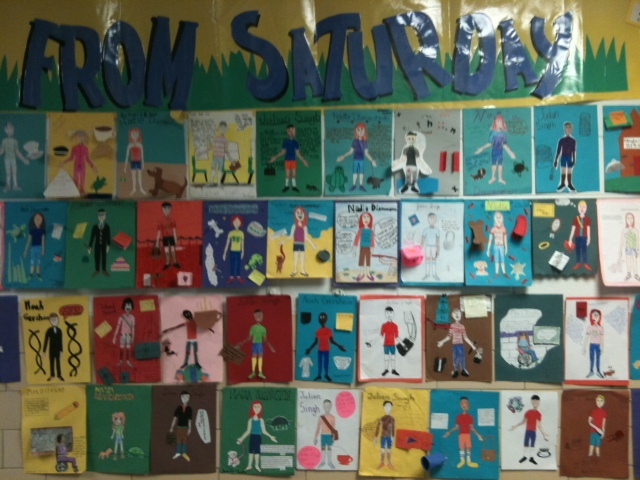 We’re taking a break from the novel, and working on collages for their journals. This way they have a personal stake in wanting to be responsible for their journal. It’s a piece of them. It should be fun. I’ll try and blog more often. It’s just been a crazy couple days. I feel bad that I have yet to blog through my first week of pre-planning. Although, part of me is glad that I didn’t. The end of my week made it better than the beginning. I had a not so wonderful first day, but followed by a good rest of the week. I love my school. I’m still not quite done getting my room the way I want it, but I thought I would share what I have done so far. I only have 2 mini bulletin boards in my classroom. This is one of them. 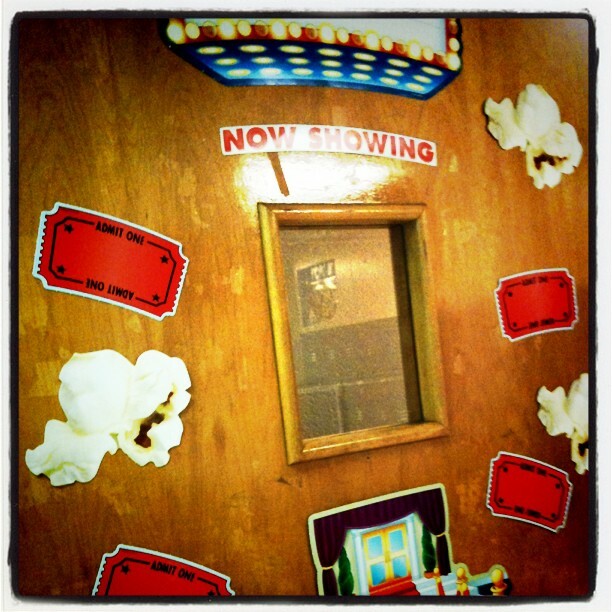 I have film bulletin board boarders that I placed around it. We aren’t allowed to put butcher paper in the background of our boards, and my board was painted blue so I kept it that way. 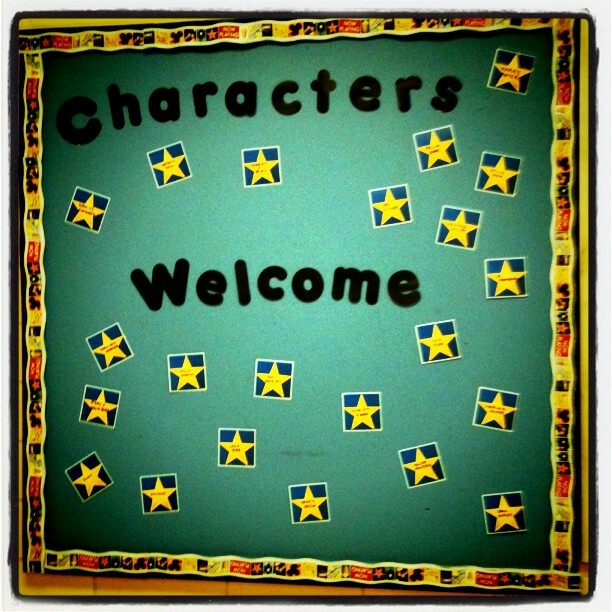 I used my Hollywood walk of fame stars around my phrase “Characters Welcome.” A little TBS reference, but I thought it was cute, and during open house I enjoyed watching my students go up to the board and try to figure out what books the characters are from. This is my current reading corner. I need to stuff some of the bean bags that a teacher at my school gave me. 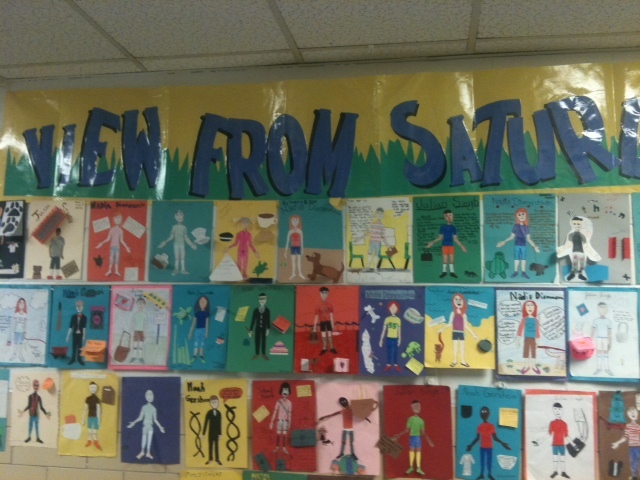 Those posters are of different reading genres. Now, my bookcase isn’t in this corner, but that was only because there isn’t enough room for it. I have it placed on one side of my room. I’m hoping to eventually do more with this area, but I figure it’s a start. 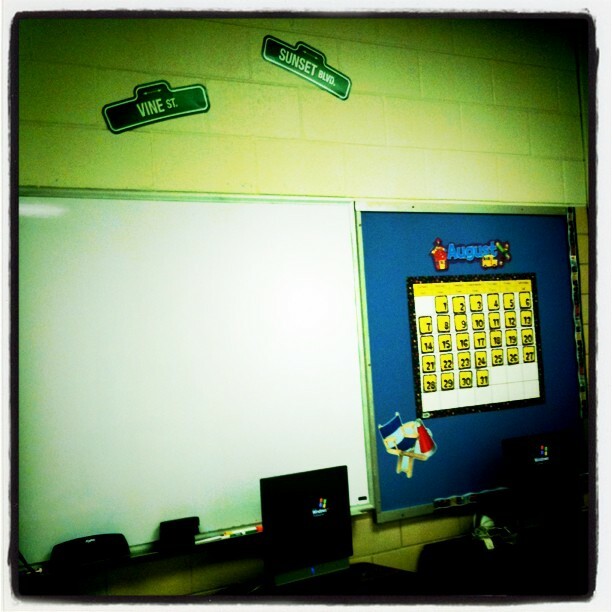 I have a few Hollywood signs (4 to be exact) I placed 2 on each side above my dry-erase and Smartboard. I haven’t finished with my Hollywood border on this mini board. I placed my calendar there, and my director’s chair. I also have my 2 student computers placed up front. The one on the left had to be there to be connected to the Smartboard. It just seemed to be easier to have both placed over there. One of my favorite things is the inside of my door. I have a marquee with my name on it. I have my tickets and popcorn and my red carpet. My door is usually open, and I feel as though it’s a great way to welcome them into my room. This is right outside my door. I wanted a cute welcome sign outside that was fun and easy for them to get to. I know they’re going to be confused that first week of school with getting to their classes. These are just a few of the things that I have done so far. I will be heading to my school tomorrow, Sunday, for a few hours to finish it up. I’ll be sure to take some more pictures and I will try to blog again tomorrow evening as it is my last day before classes start up.